there. Is this why you mentioned the pebble-throwing to me? asked our investigator. Instantly guarded, Littleton first replied that he didn't think he had mentioned anything about pebbles in the previous interview. It became quickly clear Littleton was now on the back-peddle, once again holding back. He was asked if there was ever a time he saw Michael out there after hours? Did you see him throwing pebbles at the window? Ken's response: "No." Would you tell us if you did? Would you tell anyone if you did? Ken's response: "No." A little later on in the interview, the conversation returned to this point. 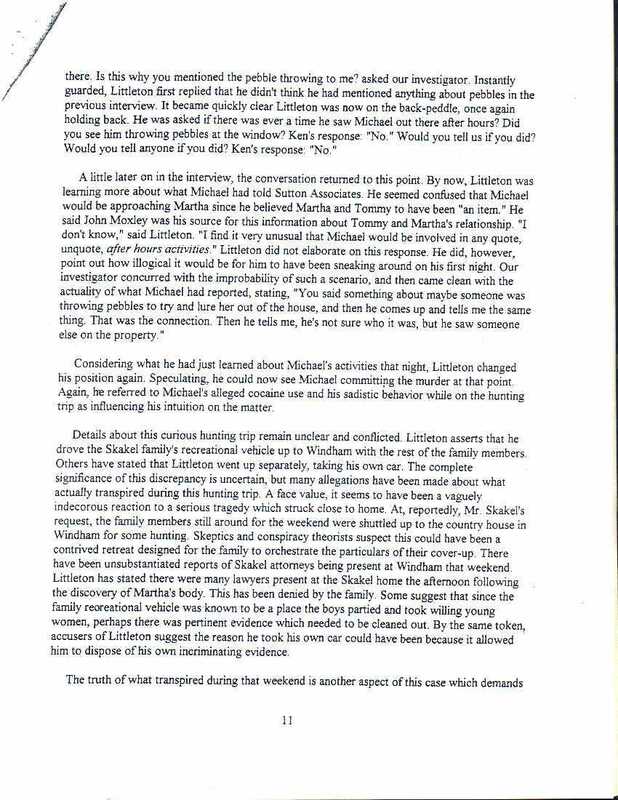 By now, Littleton was learning more about what Michael had told Sutton Associates. He seemed confused that Michael would be approaching Martha since he believed Martha and Tommy to have been "an item." He said John Moxley was the source for this information about Tommy and Martha's relationship. "I don't know," said Littleton. I find it very unusual that Michael would be involved in any quote, unquote, after hours activities." Littleton did not elaborate on this response. He did, however, point out how illogical it would be for him to have been sneaking around on his first night. Our investigator concurred with the improbability of such a scenario, and then came clean with the actuality of what Michael had reported, stating, "You said something about maybe someone was throwing pebbles to try and lure her out of the house, and then he comes up and tells me the same thing. That was the connection. Then he tells me, he's not sure who it was, but he saw someone else on the property." Considering what he had just learned about Michael's activities that night, Littleton changed his position again. Speculating, he could now see Michael committing the murder at that point. Again, he referred to Michael's alleged cocaine use and his sadistic behavior while on the hunting trip as influencing his intuition on this matter. Details about this curious hunting trip remain unclear and conflicted. Littleton asserts that he drove the Skakel family's recreational vehicle up to Windham with the rest of the family members. Others have stated that Littleton went up separately, taking his own car. The complete significance of this discrepancy is uncertain, but many allegations have been made about what actually transpired during this hunting trip. A [WW] face value, it seems to have been a vaguely indecorous reaction to a serious tragedy which struck close to home. At, reportedly, Mr. Skakel's request, the family members still around for the weekend were shuttled up to the country house in Windham for some hunting. Skeptics and conspiracy theorists suspect this could have been a contrived retreat designed for the family to orchestrate the particulars of their cover-up. There have been unsubstantiated reports of Skakel attorneys being present at Windham that weekend. Littleton has stated there were many lawyers present at the Skakel home the afternoon following the discovery of Martha's body. This has been denied by the family. Some suggest that since the family recreational vehicle was known to be a place the boys partied and took willing young women, perhaps there was pertinent evidence which needed to be cleaned out. By the same token, accusers of Littleton suggest the reason he took his own car could have been because it allowed him to dispose of his own incriminating evidence.